Sam Vanga , a MS BI Expert has explained this property in further detail along with some illustrations. The value of -1 is the default setting, it should not be altered without fully understanding the impact of the value. 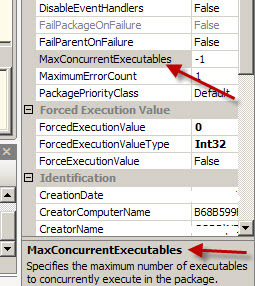 Hope this article is useful for developers working with SSIS packages. Thank you for posting this. I am just getting started with this and glad to know there are some settings while we know what they do, they are rarely adjusted.